She’s the girl that ran her high school’s AV department that everyone ignored except when she tripped over the garbage can in the hallway about twice a month. All that’s missing is the retainer and tape on her glasses. No wonder he did the secretary in the Oval Office. Except she was kind of ugly too. The 80s were a scary time. No.Late 60`s or very early 70`s. 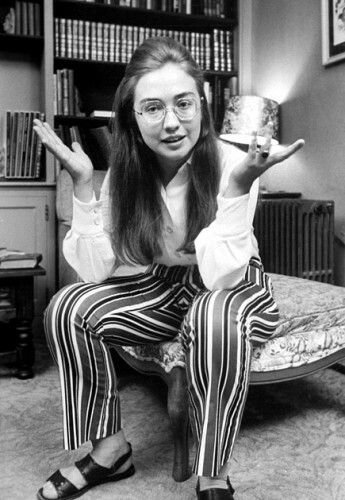 Never mind the superficial like her pants or her hair or her glasses … how about that which shines through with amazing intensity – her “crazy”?